New Hope UMC has stood on the same ground for over 200 years with its soaring spire, stained glass, and entrances surmounted by transoms to serve as major community landmark. This historic church is an example of human artistic achievement in the service of something greater than us that can make even the unbeliever’s heart jump just a little. Since we are a small church, newcomers find us to be very accessible. No one feels “lost” here. We get to know each other immediately and newcomers soon feel that they are full–fledged members of our family. We have many activities, both in “reaching-out” to the community and in our own rich social life. Thus, we are sure everyone will find a rewarding experience here in addition to the spiritual blessings of our beautiful worship services. 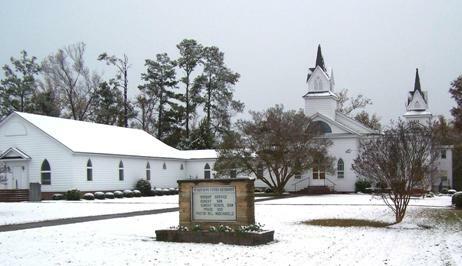 New Hope UMC is a house of worship that is wealthy in spirit having been guided for over two centuries by some of the brightest minds and most thoughtful people to inhabit Perquimans County. It is a giving church whose members look out for one another, who band together in times of strife to help those less fortunate, whether it’s a family within the community dealing with tragedy, or strangers hundreds of miles or half a world away. There are so many wonderful activities available at New Hope UMC. We have Sunday School classes for men, women, children, youth, and couples. There is an older adult ministry that is designed to help senior adults continue to grow spiritually and to find a comfortable and safe setting where they can participate in Christian education, fellowship, friendships, travel and fun. The United Methodist Men meet to promote Christian fellowship, foster leadership in the church community and grow spiritually as passionate men of God. The United Methodist Women are women of diverse ethnic and socioeconomic backgrounds; employed, not employed; housewives; businesswomen; single, married, divorced, young, middle–aged, and older women. They are women committed to mission. Bible Study at New Hope UMC is designed for people to not only understand what happened a long time ago but to also answer the questions: “What is the relevance for me?” “What is this saying to me about me?” That’s what it’s all about: Making the Bible come alive. New Hope UMC serves many people who have never attended Sunday Worship at New Hope. Our Outreach Visitation & Evangelism Ministry visits nursing homes, the homebound and hospital patients. Communion is served to approximately 200 shut-ins per month. Our Outreach Ministry visits seven local nursing homes weekly where communion services with devotions, music and hymn singing take place. The Prayer Shaw Ministry has provided over 100 prayer shawls and quilts to people in need. We are dedicated to fighting hunger in our community. Church volunteers distribute hot meals from the Meals on Wheels program to local people. Our Food Pantry distributes food monthly to all who enter the doors and ask. Our goal is to provide at least a three day supply of food with each distribution. The food provided includes fresh breads, produce, canned goods, juices, meat, pasta, cereal and beans. New Hope UMC hosts the Red Cross Blood Mobile quarterly. The church is the central collection point for blood donations within our community. Several times a year New Hope UMC hosts events of interest to our community. These include gospel singspirations, harvest days, Easter egg hunts, candlelight Christmas Eve services, sunrise Easter services on the river, trunk or treat, vacation bible school, fish fries, chicken pot pie dinners, bake sales, pot luck suppers, CPR classes, pony rides, and Alzheimer’s Disease candlelight services to name a few. This page was last updated Wednesday, January 24, 2018.